As the Bob Dylan song goes, the times they are “achanging”. But, do the lowly tyrants and dictators of our world, or those Western powers who are bonded to their hypocrisy, double standards and greed, see eye to eye with good old Bob? Is Africa to blame for the “return-of-the-dictators” malady? An extension of a disease that makes the deadly Ebola and other viruses we are believed to have infected the West with look like mole hills at the foot of the Everest. One notable dictator who got back to power after being ousted was Uganda’s Milton Obote. In his quest for power, Obote ended up butchering more human beings than the blood thirsty Idi Amin. Africa’s autocratic species maintain both their eccentricities and strong urge to maim or kill to satisfy nothing else but their very own whims. Benin’s “call-me-Socialist” Kerekou, crocodile-tears Kaunda and blood-drenched Mengistu are still “awaiting”, thanks to the spirit of our ancestors, as the late Chadian dictator Tombolbaye would have said. But confining the notion of autocracy to the African continent would do no justice to people of African descent, especially Haitians whose “Americaness” has been questioned time and over again. Their penchant for voodoo, disasters (both natural and man-made), misery and tyrants screams Africa! Even more disturbing is the hero’s welcome the bloody tyrant, Baby Doc Duvalier, got upon his return to northern hemisphere’s bellwether of failure and misery. The priest dictator Aristide’s recent return satisfies an alien logic that only a few can fathom. For me, questions abound: Why do Haitians need these pests if not to put them on trial? Why were not these fellows arrested at the airport? How come tyrants have no qualms, shame or guilt about their actions, past or present? If, as in the case of Haiti, tyrants stage a comeback (from exile or unto the political stage) are they not boldly telling us that it is up to them to decide to stay in power even when the majority of the population tells them to go to blazes? The presence of Mubarak, who tried to linger on after the people decided to get rid of him, is still felt in Egypt as his system is more or less still in place. And should he decide to stage a comeback into the political setting, as in the case of Haiti, would anything have been achieved? But at the look of things, Saleh of Yemen is finished although he is refusing to grasp his irrelevance. He is still posturing as a unifier and a bulwark against the Al Qaeda in the Arabian Peninsula. Assad in Syria is trying to weather the storm whilst his administration denies that the protests are, in fact, not protests at all. Gelleh of Djibouti has arrested and tortured opposition leaders and sought help from fellow dictator Meles in Ethiopia who is himself apprehensive of a mass uprising has tried diverting attention by suggesting a possible war with Eritrea. As for Gaddafi, he has sworn to fight on. An act that has forced to him to confront a destructive array of western powers whose alleged concern for Libyan civilian lives in Benghazi has not hampered them from bombarding Tripoli with the savagery the world witnessed some years ago in the former Yugoslavia. The same hype is activated, the media manipulates public opinion and Gaddafi, who is very much like Milosevic and Sadam, an already unsavory fellow for whom only a handful have any serious sympathy, has thus become a proper scarecrow. And through it all we observe the ugly head of Western hypocrisy and double standards that had for long been a scourge on democracy at world wide level. Hilary Clinton criticized the UAE for sending soldiers into Bahrain along with the Saudis but lamented against it for not joining the so called coalition against Gaddafi. One wonders why the West, especially America, goes through this ridiculous charade of coalition when the whole world knows the main protagonists are America and its western allies. Come to think of it, even Ethiopia was part of the coalition against Iraq! America refused to label the Saudi intervention into Bahrain as an invasion without explaining how many foreign soldiers have to cross a border with tanks and armored cars for the action to be called an invasion. Are the Saudi soldiers in Bahrain just tourists? It was interesting to hear Obama pronounce the names of Libyan towns with excellent diction whilst at the same time sounded hollow as he expressed concern for the safety of Libyans in those places. 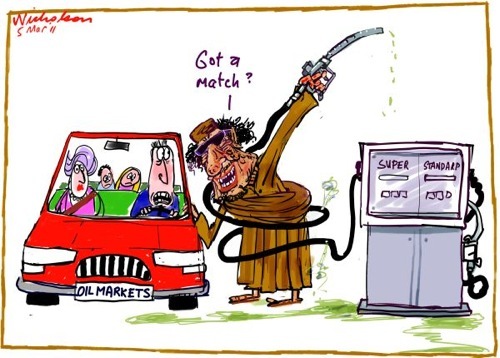 There is no doubt that the Libyan upsurge which started in the oil rich and often separatist Cyrenaica has been aided and abetted by foreign elements and later taken over by those who had for long sought the ouster of Gaddafi in order to control its oil riches. The captured Dutch mercenaries, the infiltrated American and British intelligence agents and special force elements may very well prove the assertion. Sarkozy “the Libyan” also appears as ridiculous as the Westerners’ concern for the lives of Libyan civilians. The strutting of France as a super power, a delusion of grandeur — often exercised on small countries like Chad, Cote d’Ivoire, Djibouti and Mali — would have been amusing if it had not been destructive. Sarkozy whose harsh and brutal action against Romas (Gypsies) is fresh on the minds of many; Sarkozy who is being walloped by low popularity ratings in his own country; Sarkozy who has been surpassed at the polls even by the far right wing leader of the National Front only a year away from general elections; Sarkozy, who has had to endure blunders in Tunisia where his foreign minister offered security help to dictator Ben Ali in order to quell popular demonstrations. The sudden posturing of the French President as the guardian of Libyans, arguably, has little to do with concern and everything to do with political gimmicks. Franco Libyan relations, meaning ties with Gaddafi, were strong and financially beneficial to France and Western powers. Blair and Condoleezza Rice trekked to Tripoli as did Berlusconi who publicly kissed the hands of the Libyan dictator and praised him for being a bulwark against African immigration. In their quest for oil, Britain forgot the Libyan strong man’s sins — the death of police woman Yvonne Fletcher and Lockerbie plane bombing. Instead, they acquiesced to his whims and dealt with Gaddafi as a clean and deserving partner. Gaddafi had become kosher, an ally, halal so to speak. Thus the task for the Western media in the face of Libya’s unrest was gigantic. The international “bedeviling” of the Gaddafi regime had to be fast. Minutes after the Feudal despot King Idris’ flag was resurrected the image had been beamed across the world. Shortly afterwards, the poorly armed but heroic rebels appeared on our TV screens waving the newly re-adopted flag. And the appearance of Gaddafi “the butcher” on TV was Sadam Hussein redux. Western mass media has indeed not revised its modus operandi. Why did the West not intervene in Bahrain? In Yemen? Let us take it further: what has the West done to stop the bloodshed in eastern Democratic Republic of Congo, a tragedy that has caused close to 6 million deaths by virtue of the former’s own greed for the central African country’s mineral wealth? President Obama argues that it is US policy that Gaddafi needs to go. Good! But what about pro-American tyrants like Kabila Jr, Meles, Nguema, and the despots in the Middle East? In 2005, Meles Zenawi stole an election and murdered more than 275 people in Addis Abeba alone — snipers on rooftops as in Sana’a — but he still enjoys massive US, British and EU financial and military support. There is much hue and cry as concerns Darfur and not a peep on the carnage in DR Congo. France did fine business with the dour and bloody generals in Burma and still pumps oxygen into the life support systems for many African dictators. Any claims by Britain, in the past or now for the matter, to be concerned about the welfare of other peoples, though not funny, is quite laughable. Hence, if Putin calls the campaign against Libya something like the Crusades he does have a point. Only this time it is not a religious Crusade. A crusading political gimmick at its best. It all smacks of an ill concealed colonialist arrogance and violence. Base and crude economic interest is at the bottom of it. Oil. The times they are “achanging” for sure, but as the saying goes, the more things change the more they stay the same. Mubarak and Ben Ali were allies of Washington. And like them, Gaddafi and Saleh will go as it is the will of the people. The war of the West against Libya, however, has nothing to do with democracy or defending civilians. Other pro-American dictators in Africa and the Middle East will also, undoubtedly, face popular uprising. Meanwhile, Bahrain, as at now, is an indicator that helps us to judge how the West will try to salvage their allies until it becomes diplomatically impossible and it is forced to sing another tune.